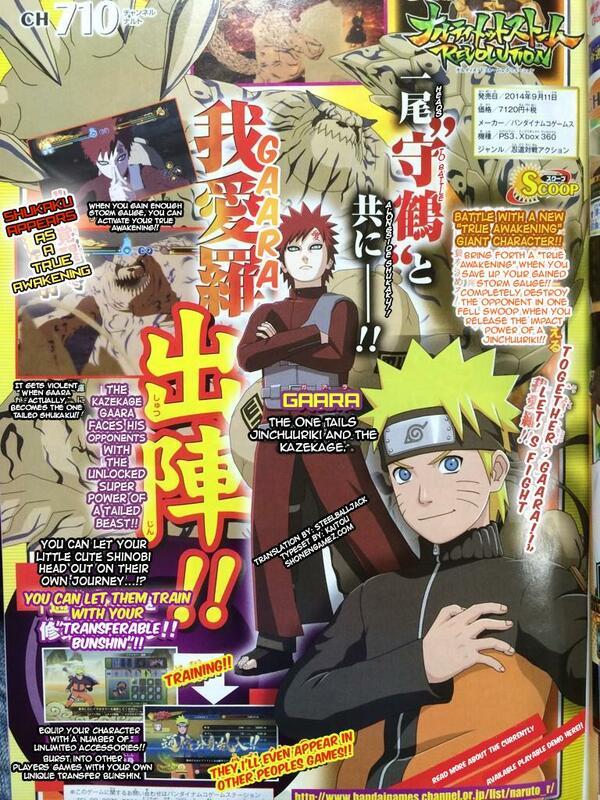 Here are the translations for the latest Weekly Shonen Jump scan for Naruto Shippuden: Ultimate Ninja Storm Revolution. As previously reported, Gaara will be able to fight together with Shukaku when using his True Awakening form. The scan also provides more details on the new customization feature. You will be able to choose from an unlimited amount of accessories to equip. Additionally, you can “Burst into other players’ games with your own unique transfer bunshin”. While is it not clear what that means, SteelBallJack thinks it will be similar to the latest Tekken games where a ghost of other people’s customized characters appears in game. I THOUGHT THE PAST GAARA WAS THE SHUKAKAU. bloq mayus?are you from Spain? Thank you. I’ll make sure to appreciate your effort. Shukaku looks awesome, even better than in Storm 1 imo! wow, such smexy such kazekage hotness, very sand much racoon wow. kakashia has a perfect suanoo is kishimoto doing drugs?? Pretty sure it`s like Campaign mode with JoJo ASB and the whole Ghost deal in the Tekken series (CC2/Namco and Namco so pretty sure I`m near enough 100% correct) we will just have to wait for 100% confirmation. They have time to be making little items and this dumbass network clones, but they can’t make new move sets or give us more customize options to the point we can change jutsu sand ultimates. Wow cc2 yes you really are trying to revolutionize the naruto storm series. This game will die faster than storm 3 I can tell u that.